Breaking boundaries to render The Forgotten Realms. This piece is part of a series of articles that ran in PC Gamer UK issue 326 celebrating Baldur's Gate, 20 years on. We'll be posting more in the next few weeks. For more quality articles about all things PC gaming, you can subscribe now in the UK and the US. 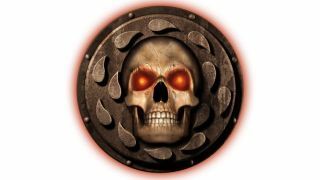 Baldur’s Gate is powered by the Infinity engine, a bespoke technology created by BioWare specifically for the game. Simple in its exterior, Infinity makes the complexity of Advanced Dungeons & Dragons playable with just a mouse, and makes use of a visual style that boils down to a bunch of animated sprites walking on top of some beautiful paintings. Looks can be deceiving. Beneath those simple backdrops was a deep and complicated engine made up of many different tools and technologies. It was hugely advanced and also hugely idiosyncratic, while getting it to work in the way BioWare wanted was, frankly, a nightmare. The Infinity Engine would then perform a prototypical version of modern level-streaming, adding new chunks of the background into memory as the player moved forward, and dropping off-screen chunks as they were no longer required. This ‘tile-management’ system was incredibly complicated, requiring a huge amount of work to optimise and necessitating lengthy loading times between screens. To manage these assets, BioWare’s lead programmer Scott Grieg created a memory management system called Chitin. This worked a little like a slide projector, offering your 4MB PC a tiny window into Baldur’s Gate’s much larger dataset. But problems began to arise when Grieg decided to make Chitin multithreaded. “Chitin wasn’t multithreaded inherently. But partway through development they designed the AI system and the pathfinding system, and part of that design was getting excited about the idea of multithreading,” Oster says. In theory, this was a great way of offloading the data Infinity had to crunch through to make the game work. But at the time, multicore processors didn’t exist. “When you actually think through how the data is held in the processor, and how it’s interacted with, what you just engineered is a scenario for countless pipeline stalls,” Oster points out. Amongst these core technical issues were dozens of other problems. Baldur’s Gate’s UI is not an overlay, it’s hard-coded into the game. Again, this was done to increase performance. “Baldur’s Gate’s UI is fat to cover up the screen, so you don’t have to render as much of the background,” But this also meant the only way to make a change to the overlay was to do it via the game’s code base. Want to move an icon from the left to the right of the screen? You could potentially break the game. All of this meant that BioWare created problems for itself that could only be solved through brute force, testing every line of code, painstakingly clipping out objects in the background so that characters could walk behind walls. “The approach that BioWare took at the time, was, ‘We don’t know the right way to do this, we don’t know how to automate things. Let’s throw humans at the problem, and with enough sweat the problem will go away,’ remembers Oster. This, ultimately, is the real story of Baldur’s Gate. The trials of BioWare’s Infinity Engine were not just technical, they were physical, too. “It was a monumental achievement at the time,” Oster concludes.